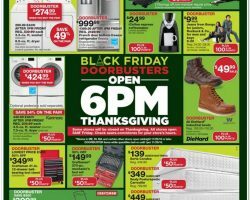 View Sears Black Friday 2015 ad. 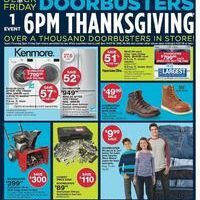 Save with this year Sears Black Friday deals on DieHard Work Boots, French Door Bottom-Freezer Refrigerator, Ladies Puffer Jackets or Puffer Vests, Bongo Fold Over Yoga Pants, Laura Scott Front Zip Jackets, Metaphor Jeans, Covington Sweaters for Misses and Petites, Jewelry Boxes and Rosetti Handbags. 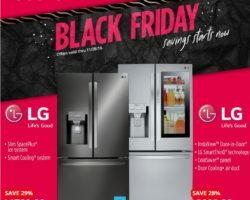 Sears Black Friday Sale 2019. 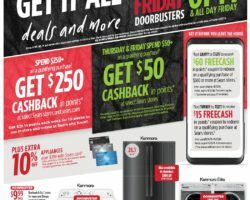 Find Sears Black Friday ad, deals and sales for 2019 from blacknfriday.com. 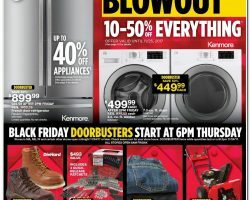 Sears is a department store chain in America that sells both in traditional stores and online a good selection of various types of merchandise including clothing, bedding, appliances, tools, beauty items, jewelry, footwear and more. 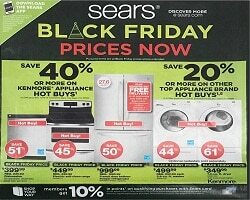 The company was founded in 1886 and it is today a subsidiary of Sears Holdings. 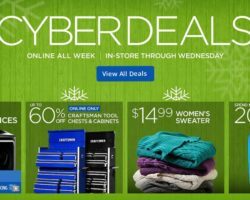 As an online retailer, Sears provides easy access to top quality products and convenient ways to shop. 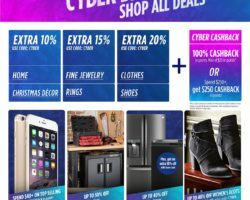 The retailer often includes additional promotions for online purchases and features percents off selected categories on a daily basis.